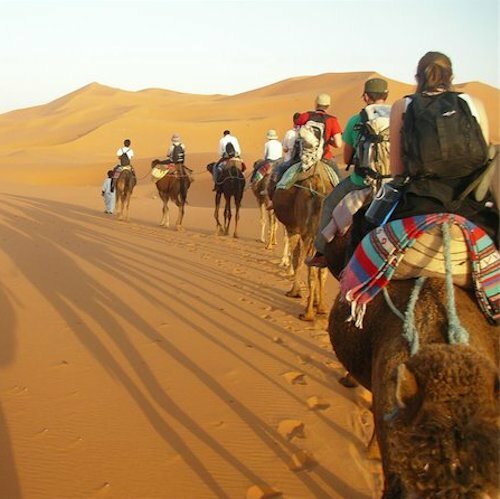 Adventure travel is becoming more popular all the time. It can be very expensive, though, and even a bit too dangerous for some of us. It doesn't have to either, though. Here are a few ideas for small adventures you can afford. They are followed by a definition of adventure that will help you add your own to the list. Try treasure hunting. Rent or buy a metal detector and spend a relaxing but interesting weekend finding coins, jewelry and who-knows-what in the sand at the beach. No beach nearby? Look up the historical records for your town, to see where old picnic grounds were. Treasure hunters regularly find old coins at places like these. Take climbing lessons. Whether this is on Mount Ranier in Washington, or Mount Washington in New Hampshire, it's sure to be an adventure. At least it will be more exciting than my trip up a local sledding hill with my ice-axe and crampons. Travel form monastery to monastery. Make it a spiritual adventure or just relax. Most monasteries take in visitors, and usually have reasonably priced accommodations. The Buddhist ones in particular are most often in beautiful places. Do a hot springs tour. This is for those who live in the west. Get a guide to hot springs or copy directions off the internet. Bring swimming suits (optional at some, for the more adventurous), towels and a cooler full of refreshments. Want more adventure? Seek out the ones that you have to hike into the wilderness to find. Find and summit the highest peak in your state. This might be less-than-adventurous in some states, but it will at least be an excuse to get outside and get some good exercise. Be sure to bring your camera for the summit shot. You might try the highest point in the next state over for your next adventure trip. Investigate and find the nearest hidden swimming holes. The best ones are ones that require a hike to get to. Watch for people heading down a trail with swimsuits and a cooler. Nobody hikes in swimsuit and drags a cooler into the woods, unless there is water involved. Play Tom Sawyer and Huck Finn. Locate the nearest river that is large enough and has some public forest. Then build a raft from dead trees and float downstream for a day. We usually started by hiking upstream for an hour or more, so we could float back to the car. A vagabond trip. Pack enough clothing and snacks for several days and just start driving, with no destination in mind. Who knows where you'll end up, and what you'll discover. Pack a tent or camp in your car to keep it really affordable. That last one is a classic adventure trip in my book. Adventure is any activity you engage in that is new to you and doesn't have a predictable outcome. It doesn't need to be dangerous to be interesting and fun, and could even include a trip to the nearest large city for a weekend tour of the nightclubs. Of course, depending on the places you choose, this could be fairly dangerous adventure travel.